The Duke of Beaufort Hunt...The mounted field wait in a clearing on the Badminton estate, while the huntsman and hounds draw a covert. 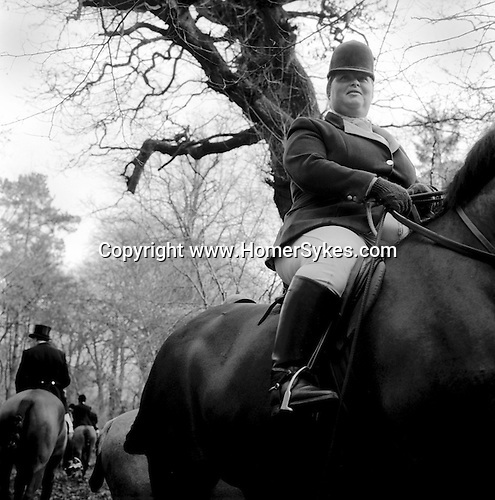 The Boxing Day Meet, Worcester Lodge, near Didmarton, Gloucestershire 2002. Unlike most hunts, the huntsman and whips do not wear traditional red coats, they wear green which was the colour of the livery worn by outdoor servants - coachmen and hunt servants. The Heythrop Hunt's livery is identical, echoing the days when all that country was hunted by the same pack. ..Hunting with Hounds / Mansion Editions (isbn 0-9542233-1-4) copyright Homer Sykes. +44 (0) 20-8542-7083. < www.mansioneditions.com >..